What seem like everyday occurrences of connectivity across the web would have been beyond my wildest dreams back in the mid 1990s when just hand coding web pages and linking was intoxicating enough. I almost forgot about this interesting series of small events. 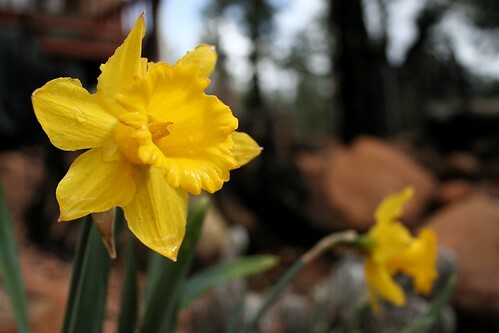 In late march of this year, our daffodils started blooming up at our cabin in the pine forests of north/central Arizona. Like clockwork, I was taking some photos and posting to flickr on March 23. My name is Kaitlin and I work for NowPublic.com. I’m working on a story about Ireland’s Daffodil Day, an annual event that raises funds for cancer research and treatment. I’d like to use your photo of a daffodil to help compliment my story. NowPublic is a news sharing community that relies on stories, photos, & videos from people like you. Would you be interested in sharing your work with our members? If so, or to learn more about this request please click the link below. Of course I’d share the photos- the process was easy, and as smart as Amazon.com. They provide a credit link in the comments of my original flickr photo. Wow, I never heard of Daffodil Day, which now I now is an Irish Cancer Society fundraising event. Daffodil funds have led to the setting up of cancer home care teams in almost every county in Ireland. Over the past nine years, we have provided funds health boards and hospice groups to support the employment of specialist nurses skilled in the care of patients with advanced cancer. These nurses work with family doctors and public health nurses to form home care teams bringing care and support, free of charge, to cancer patients and their families in their own homes. And NowPublic story published a story that same day, and my Arizona Daffodils are among the 28 others associated with the story. And I was hardly alone. In a two week span, my two photos were among 5880 other flickr photos of daffodils. Am I the only one boggled by that volume? a participatory news network which mobilizes an army of reporters to cover the events that define our world. In twelve short months, the company has become one of the fastest growing news organizations with thousands of reporters in over 140 countries. During Hurricane Katrina, NowPublic had more reporters in the affected area than most news organizations have on their entire staff. And no, surpise, they are based in what seems like one of the prime nexuses of cool web stuff- Vancouver. People volunteer to write stories, contribute media, etc, almost 90,000 of ’em in over 3000 cities. Maybe the “stories”, mostly one-two paragraphs, are not the meat of the New York Times, but the model, the current-ness of the items, and the use of media is powerful. I wonder how they are dealing with teaching journalism these days? I am not suggesting this way of publishing news replaces other outlets, but it ought to get the traditionalists some food for thought. And a sidelight- the URL above (http://www.nowpublic.com/node/161611) and the page source gives this away as another powerful drupal run site. Daffodil day is not unique to Ireland, the UK have a Daffodil day too, as does New Zealand, and i suspect many other countries around the world, all raising money for cancer research. Hi,very colorful article in this nice website. I will come here usaually to support you.So beautiful photoes of these lovely flowers. So is this article here,and. I will often come. Pls keep it.